​GuardMagic mTF3 is an universal "GPS & Fuel Data Logger" with additional inputs, driver identification function and USB output interface. GuardMagic mTF3 is intend for the control of vehicles and special technics (road, building, construction, maintenance, earth moving, agricultural machines etc.). support up to THREE Main Fuel Tanks (GuardMagic DFLS with digital 485 interface). support up to THREE Cargo Fuel Tanks (GuardMagic DFLS with digital 485 interface). engine rounds and vehicle odometer control function. Data moving from GuardMagic mTF3 to Personal Computer is carried out by standard "USB Flash Drive". Loading data from "Fuel & GPS data Logger" GuardMagic mTF serie; Generation fuel and standard reports of vehicle activity; Fuel consumption control; Diagrams generation; Visualization track, points in electronic maps. Loading data from "Fuel & GPS data Logger" GuardMagic mTF serie; Generation fuel, standard and advanced reports of vehicle activity; Fuel consumption control; Diagrams generation; Visualization track, points in electronic maps. Client-Sever based. 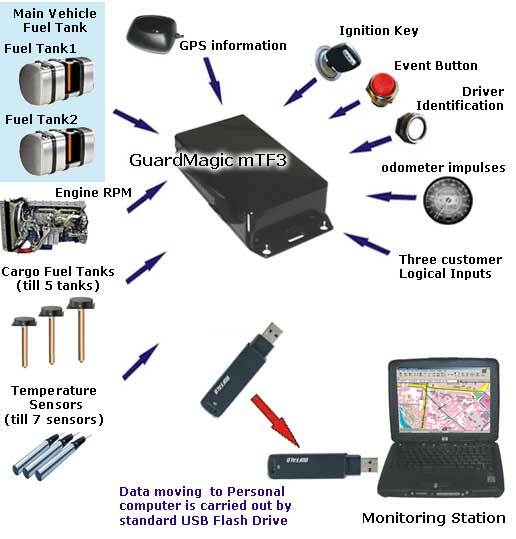 GuardMagic mTF3 is established on a vehicle and record in the internal memory fuel history of fuel tank (fuel level in fuel tank), route of transport movement, parameters of movement etc. After the return to the garage to GuardMagic mTF3 connected a standard USB Flash Drive. All data stored in GuardMagic mTF3 removed to this USB Flash Drive. Later this data from USB Flash Drive moved to a personal computer with monitoring software. The monitoring software analyzing the loaded data and generate reports and diagrams about vehicle activity, fuel consumption, fuel usage (including drain and fueling), and visualizate main information in electronic maps.